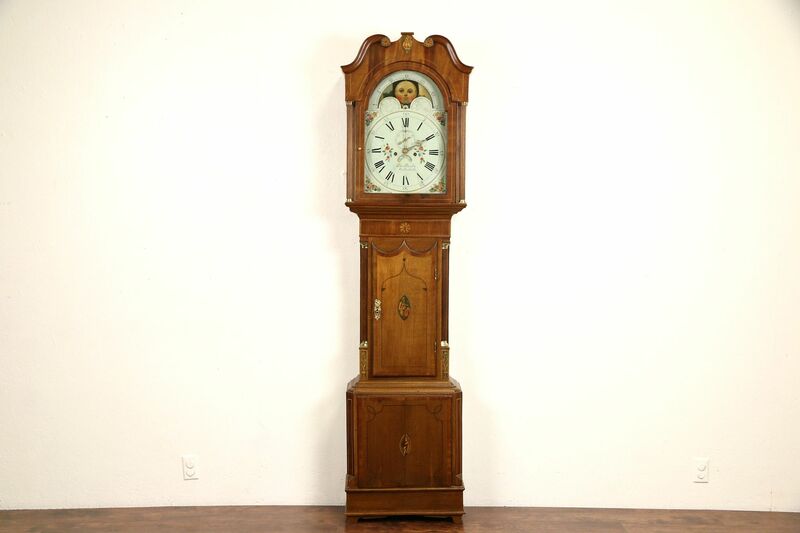 From the Georgian period about 1800, a stately grandfather or long case clock from England has an oak and mahogany case with inlaid banding and intricate marquetry medallions. The restored finish is excellent, preserving mars, stains and restorations for antique character, the base is rebuilt. There are shrinkage separations and warps from age, see photos. An original brass movement has been professionally cleaned and oiled, and runs accurately for a week on a winding. A bell counts the hour. The hand painted dial is signed "Peter Bowlen, Rutterforth," and has some repainting. Above a map of the world, the moon dial has exceptional painting. Brass mounts and reeded columns are original, the lower door has a later working lock. Measurements are 23" wide, 10" deep and 86" tall. This clock needs to be "set up" when delivered - weights and pendulum attached and the case leveled. Most of our customers can do this as we walk them through the fairly simple steps by phone. The process is not very difficult, and it is also nice to know how to do this again whenever the clock needs to be moved for cleaning, painting or whatever. A few customers prefer to hire a local clockmaker at their own expense to make a house-call and set up the clock, which is usually not very expensive, depending on your location.